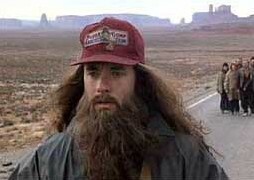 I think one of the reasons that I’ve been surprised by this is because even though I’ve seen Forrest Gump many, many times, it wasn’t until I moved here and heard people talking about ‘Forrest Gump Hill’ (the stretch of road between Mexican Hat and Monument Valley where Forrest decided to stop running) that I realized that part of it was shot here. Harry and Leone ‘Mike’ Goulding came to Monument Valley in the mid-1920s to homestead and open a trading post to trade with the Native Americans (mostly Navajo) who lived in the area. By the 1930s, between the Great Depression and two bad years of drought, the area had really been hit hard. In 1938 Harry learned that the Hollywood film company, United Artists, was looking for a location to shoot a new western movie. Harry recruited Josef Muench- a photographer who had first visited and photographed Monument Valley in 1935, to compile an album of scenes of the valley for Harry to present to United Artists when he arrived in Hollywood. As unlikely as this story sounds, it really happened and Harry’s idea worked! Harry was able to get his photos of Monument Valley into the right hands and John Ford shot ‘Stagecoach’ in Monument Valley the very next year. But this story doesn’t end there- over the next 25 years, John Ford came back and shot 6 more movies in Monument Valley, which played a huge role in Monument Valley becoming the iconic image of the American West it is today. 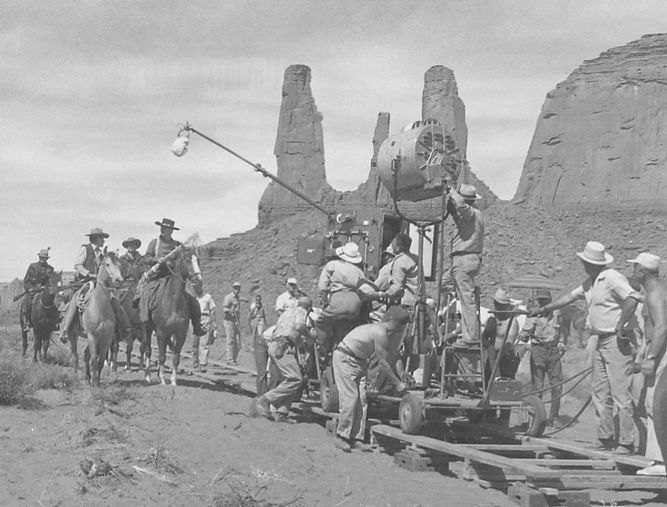 The first of the John Ford/John Wayne movies to be filmed in Monument Valley was ‘Stagecoach’ which was shot in 1939. 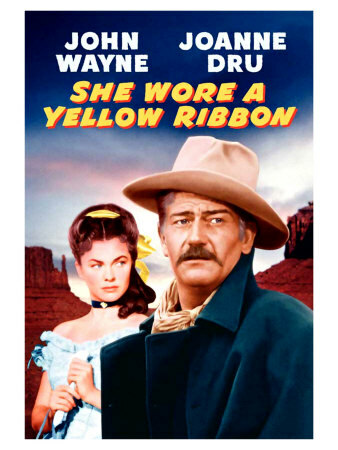 ‘She Wore A Yellow Ribbon’, another John Ford/John Wayne western, was shot in Monument Valley in 1949. 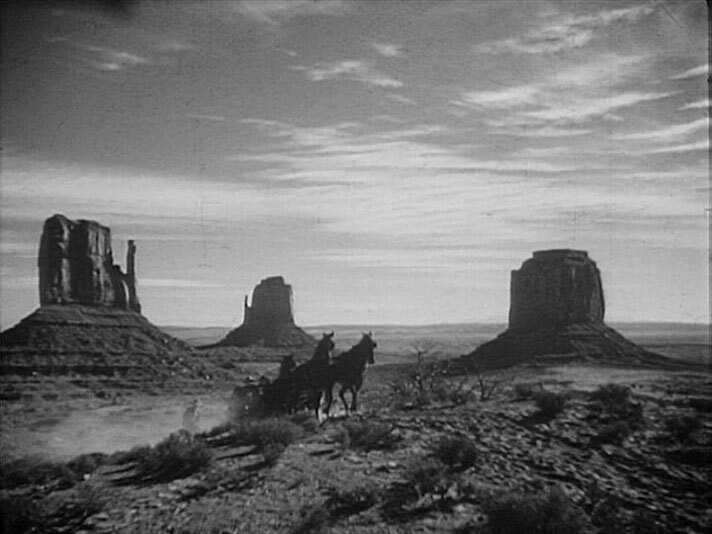 Another John Ford/John Wayne movie filmed in Monument Valley was ‘The Searchers’, which was shot in 1956. 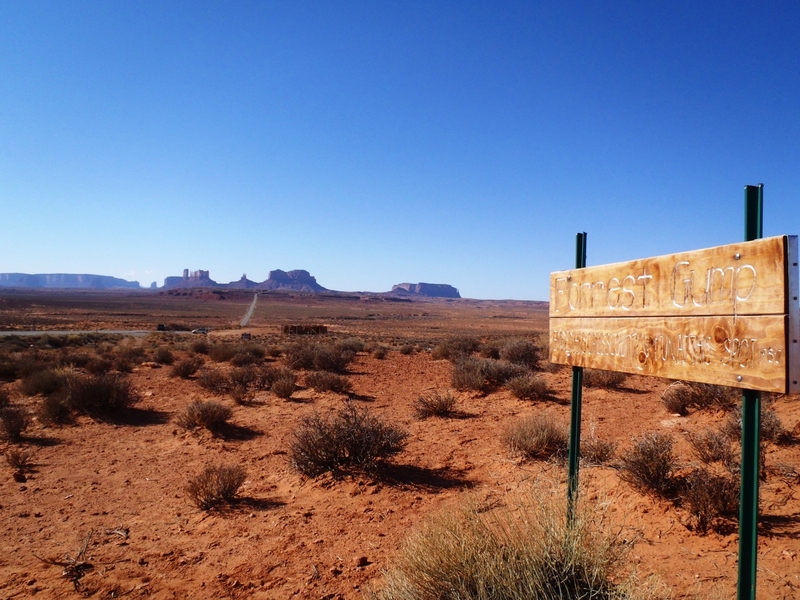 John Ford filmed so many movies in Monument Valley, there is even a viewpoint that has been named after him- you can see it in the picture below. Monument Valley became very well known for westerns, but there have actually been quite a wide variety of movies filmed there- action, comedies, science fiction, drama, etc. 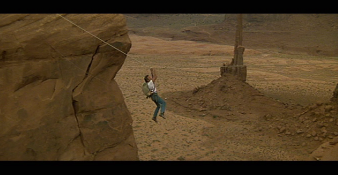 In 1975 part of the Clint Eastwood movie ‘Eiger Sanction’ was filmed in Monument Valley. 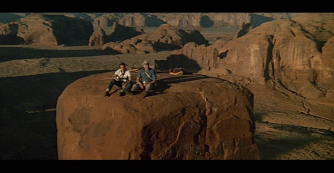 This movie takes place in the Alps, but has a scene that was shot on top of the ‘Totem Pole’ rock formation in Monument Valley. 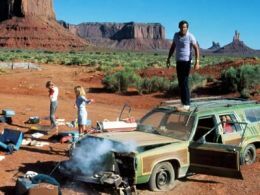 You might also remember the scene in ‘National Lampoon’s Vacation’ where the Griswold family’s car breaks down- that was shot in Monument Valley in 1983. This brings us to one of my favorites- ‘Back to the Future’! While the first Back to the Future movie is BY FAR my favorite in the series- I’m still excited that part of the 3rd movie was filmed in here- I can’t believe the Back to the Future Delorean was in San Juan County! 88 miles per hour!!!! 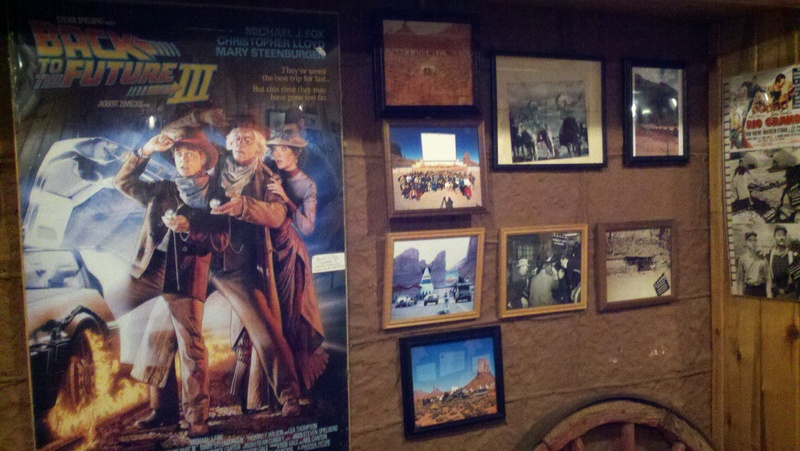 Another of my favorites- ‘Thelma and Louise’- filmed in 1991- also had scenes that were shot in San Juan County. 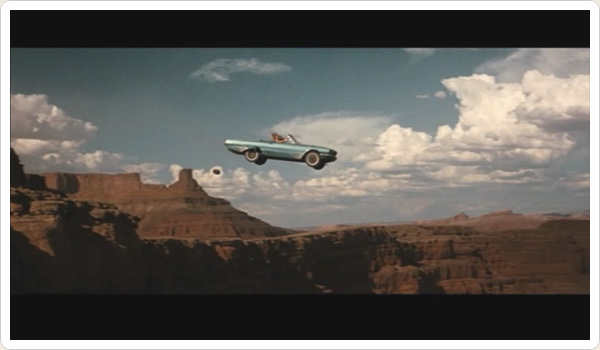 They filmed in several locations in the Moab area, but the final scene where Thelma & Louise drive their car off the cliff (in the movie I think they say that it’s the Grand Canyon) is at Dead Horse Point State Park. Dead Horse Point is often associated with Moab since that’s the closest town, but it’s actually in San Juan County. It’s hard to believe it’s been 20 years since that movie came out! 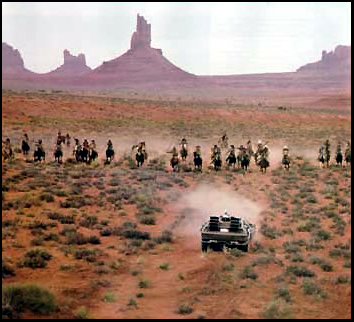 As I mentioned above, part of the running scene in ‘Forrest Gump’ was shot on Hwy 163 between Mexican Hat and Monument Valley in 1994. 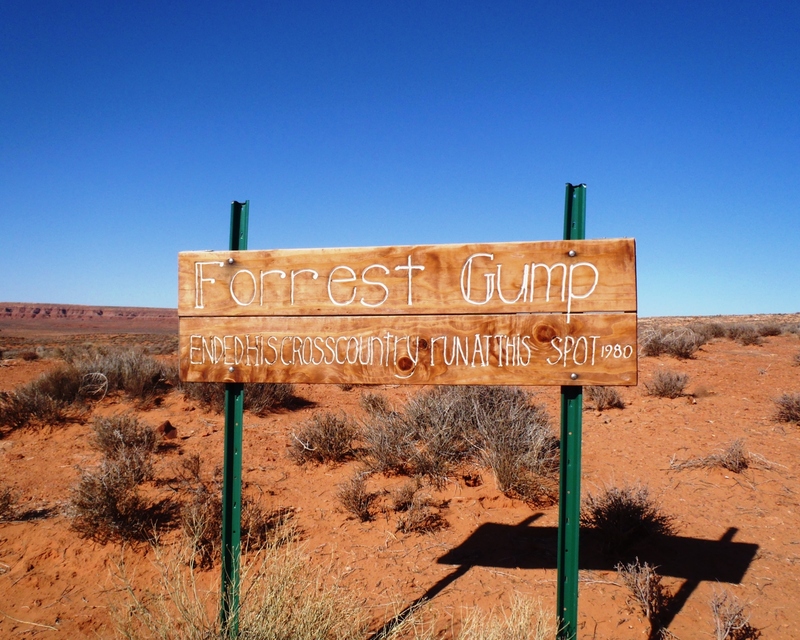 This stretch of road is now known as ‘Forrest Gump Hill’. 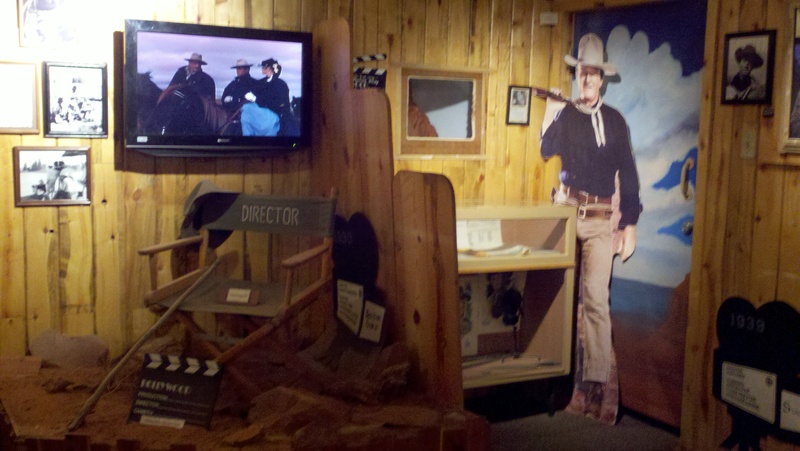 A few scenes from ‘City Slickers II: The Legend of Curly’s Gold’ were shot at Dugout Ranch in 1994. Dugout Ranch is located on Hwy 211 leading to the Needles District of Canyonlands National Park. 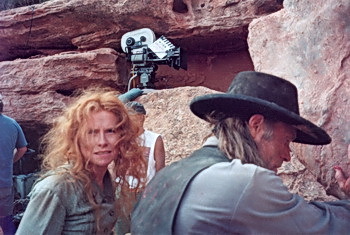 Another movie that was filmed at Dugout Ranch was ‘Riders of the Purple Sage’, shot in 1995. Just last year the TV show, ‘Dr. 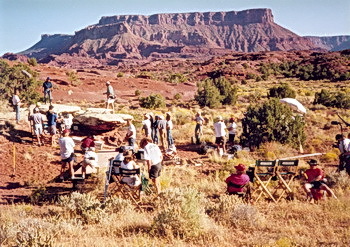 Who’ shot scenes for two episodes (‘Impossible Astronaut’ and ‘Day of the Moon’) in Monument Valley and Valley of the Gods. Not only has Monument Valley appeared in countless movies and commercials, it’s also made an appearance in comic strips and cartoons as well. 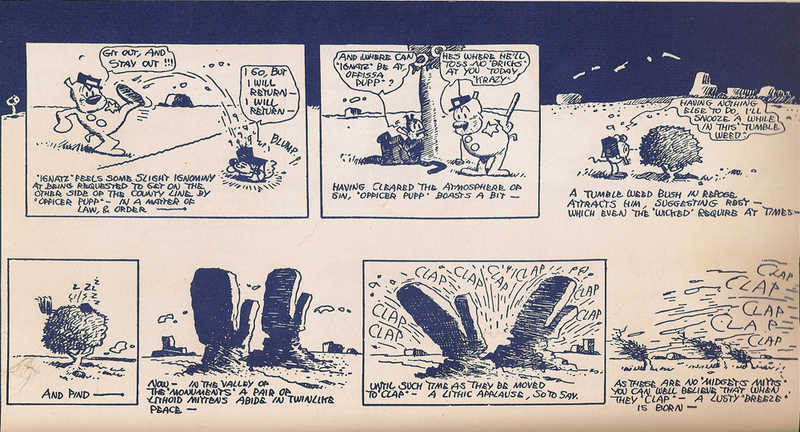 One of the oldest examples I found was a Krazy Kat comic strip created by George Herriman. I’m not sure of the exact year of this particular comic strip, but Krazy Kat was published in newspapers between 1913 and 1944. 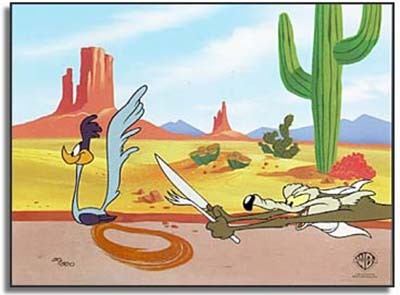 Of course we all remember the endless desert landscapes in the old Road Runner cartoons- I don’t know that it can be confirmed that the backdrop is Monument Valley, but it looks like it to me! 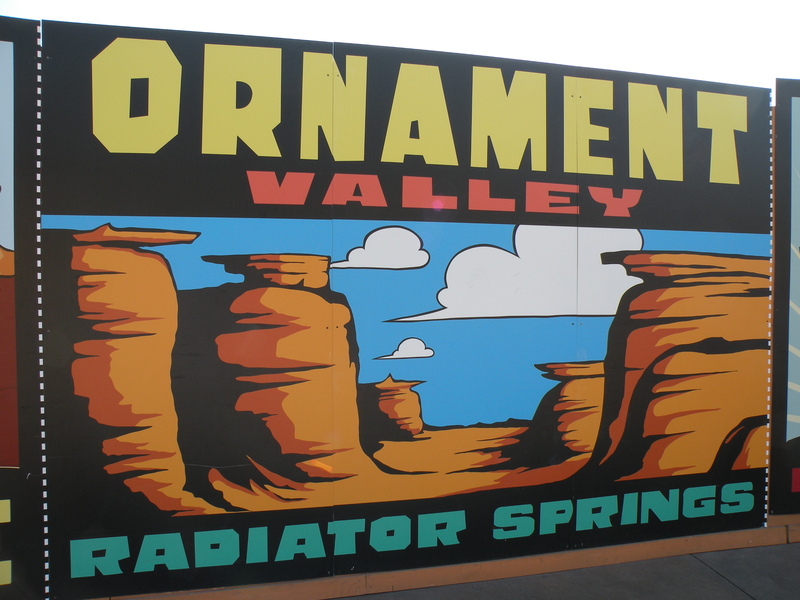 And a much more recent animated film, ‘Cars’- which came out in 2006- spoofs Monument Valley with an area called ‘Ornament Valley’. 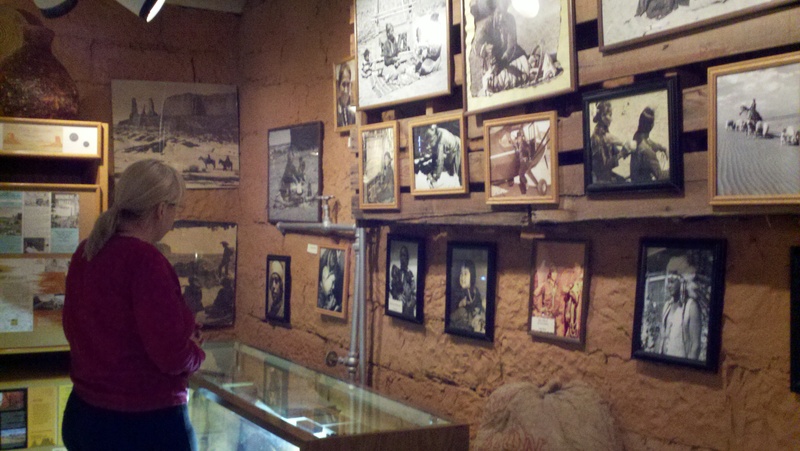 The Goulding’s Lodge Trading Post & Museum in Monument Valley, is a great stop if you’re interested in the movie history of the area. 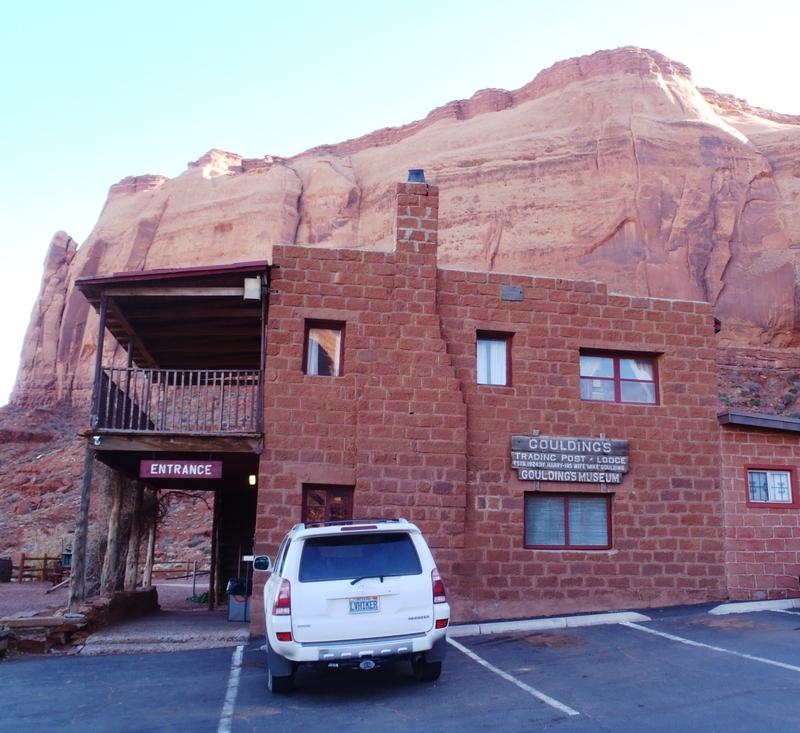 The building is the original trading post that Harry and ‘Mike’ Goulding built a few years after they first arrived in Monument Valley. 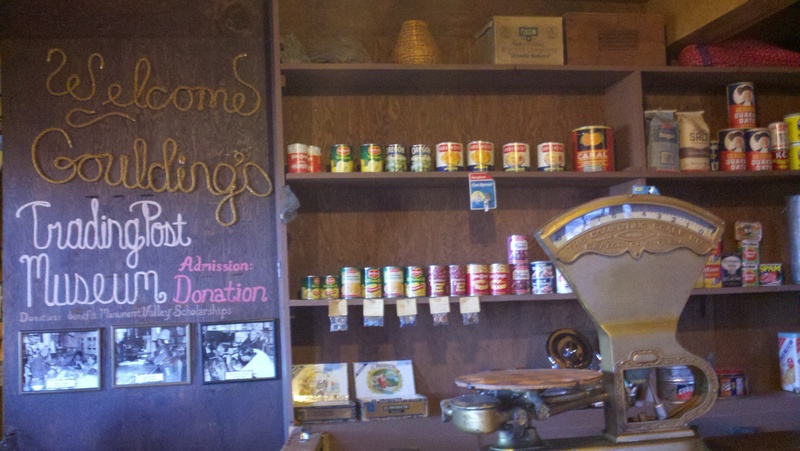 Part of the museum is set up like the old trading post, another part is filled with movie memorabilia, and the upstairs- which was originally the Gouldings’ living quarters- is still set up with their furniture and some of their belongings. 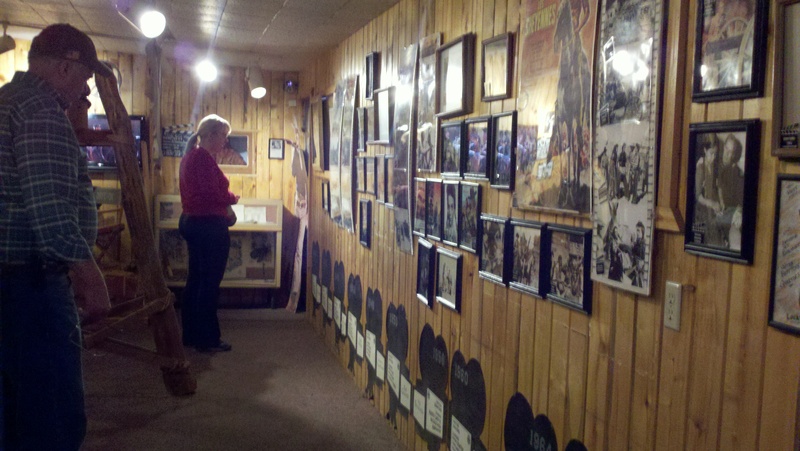 The museum is free to the public and is located next to the restaurant and gift shop buildings. 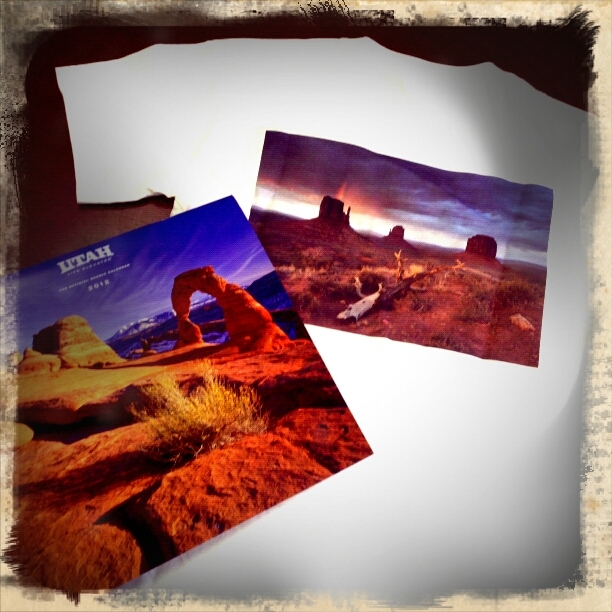 Keep an eye on our blog in the next couple weeks for another giveaway… and don’t forget to ‘like’ us on facebook so you don’t miss out on the San Juan County/Utah goodies we’re planning to give away! Prizes for our upcoming giveaway! This entry was posted in Giveaways, Monument Valley, Movies, Museums, Things to do for FREE!, Travel, Utah and tagged Dead Horse Point State Park, Giveaways, Hwy 211, Monument Valley, Movies, Museums, Things to do for FREE!, Travel, Utah, Valley of the Gods. Bookmark the permalink. nice idea that they actually put a sign up where the run ended 🙂 – nice pictures! Thanks for your comment SkP! I’ve been through that area many times, and I often stop at that same pull-out to take pictures, and that was the first time I’ve seen the sign. I’d heard about it before though, so I’m not sure if it gets stolen a lot or what, but as of 2 weeks ago- it was there! Beautiful photos and history. 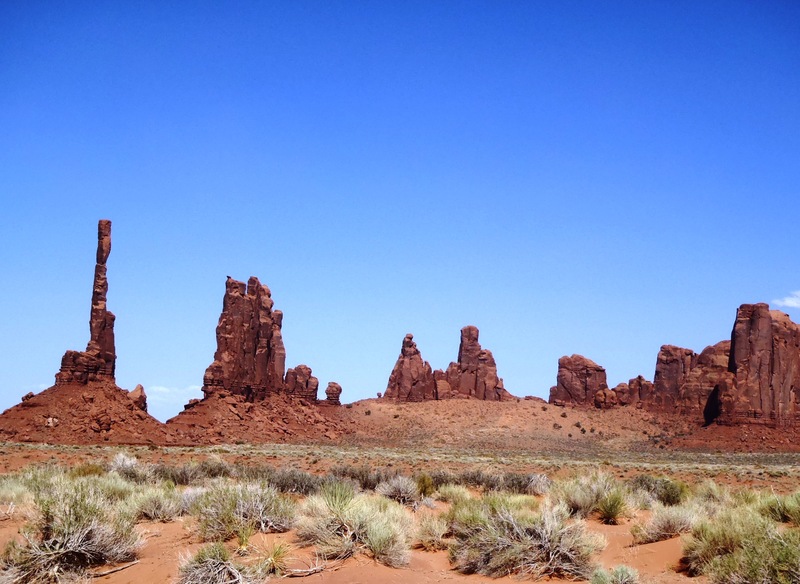 Here three times, always marvel at the beauty of Monument Valley. First visit arrived at Gouldings late. Wife woke me up had coffee ready, sat me down and said “Are you ready for this” opened the drapes and there it was. My face said it all. She’s gone now, each time I return the memory relives that first visit. Monument Valley is one of those special places that validates “America the Beautiful”. Appreciate this site. Thank you. 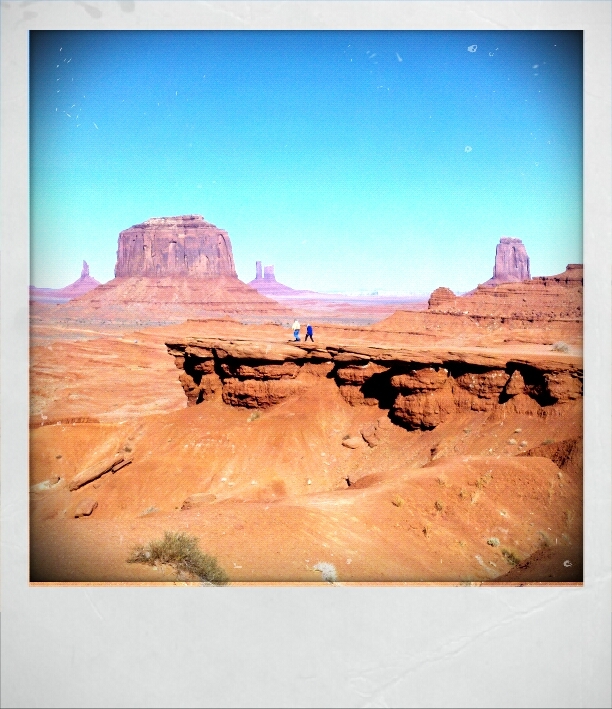 Carm- Thanks for sharing your Monument Valley experience with us- what a great story of your first visit! Just got home from gouldings lodge last week.The most amazing place ive been and yes when you open the curtains its breathtaking. UTAH is a beautiful state – the scenery in monument valley is breathtaking- Sadly couldn’t find the FOREST GUMP HILL sign ( sept 2013) —- Got some great Photos anyway.Brian K. SYD/AUST. PS The staff at Mexican Hat INN awesomely nice people. Thank you for your comment! Glad to hear that you enjoyed our beautiful state so much! 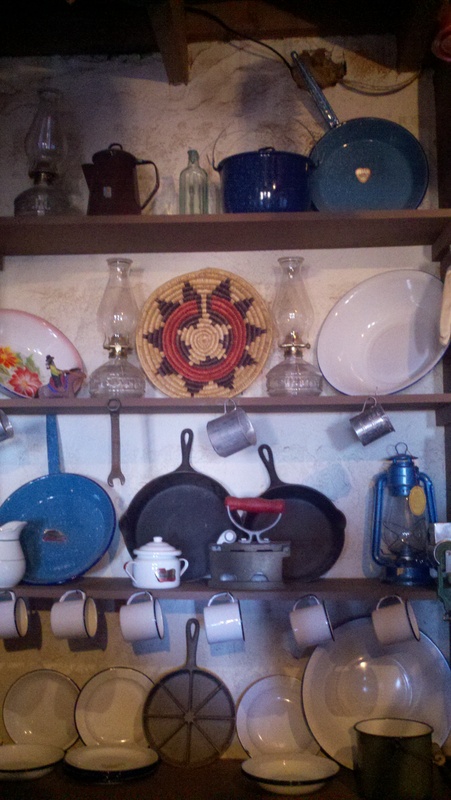 I’ll pass along your positive feedback to the Mexican Hat Inn, I’m sure they will be happy to hear it! Would you be able to tell the exact point where the DeLorean journey was filmed in Back To The Future 3? 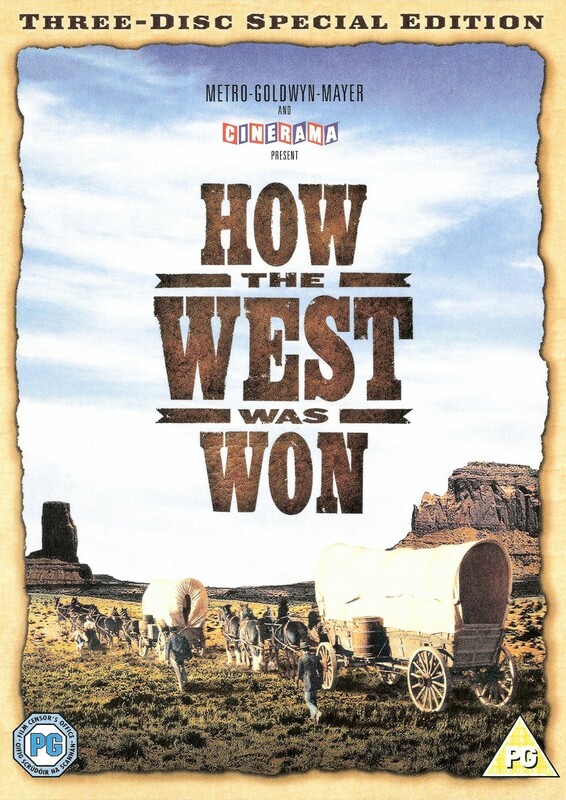 Was it between Sentinel Mesa and Stagecoach? Thank you.